When you have a loved one with memory loss, life often becomes overwhelming; both for you, and for who you care for. You may find yourself frustrated, worried, or just at a loss for what to do. Thankfully, you need only reach out to our team at Shelby Crossing Health Campus to find that we’re here. In our Memory Care neighborhood, seniors with memory loss can find comfort, dignity, and joy. Our private suites are places of peace, and our caregivers are mindful of every resident’s unique needs and challenges. Their wellbeing is at the center of everything we do, from the way we enjoy our meals together, to the specialized programs we offer and the support we provide for the people who care about them the most – their family. The best Memory Care services are rooted in a clinical understanding of Alzheimer’s disease and other forms of dementia. This is why, in our Memory Care neighborhood, we offer programming such as our Daily Rhythms program, which is supported by national Alzheimer’s advocacy groups. Those with memory loss need a schedule they can rely on. 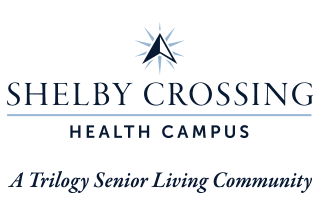 At Shelby Crossing Health Campus, we provide this schedule, along with compassion, understanding, and comfort, every day. During a memory loss journey, short-term memories fade, while long-term memories remain. These memories serve as an anchor for those with memory loss, and allow them to experience moments of joy. Creating these special moments is something we’re passionate about at Shelby Crossing Health Campus. Here, one-time fishermen can find themselves back on the water, cooks can lend a hand crafting family recipes, and music lovers can feel the way they felt on the dance floor, all those years ago. Each moment is a chance to bring a smile to the faces of those we serve, and we make every moment count. The best Memory Care services make a difference. Contact us to learn more.